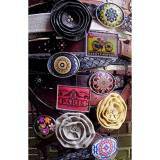 Create your own style by mixing and matching our great buckles with the fun belt strips. The buckles add as much personality as the strips do but when you combine them you get a fantastic addition to any pair of jeans! Combinations are endless. We will suggest a couple of strips to go with each buckle in the suggested areas.